Fans of the AMC show Breaking Bad will remember the Original Gangsta [Hector Salamanca]. When first introduced to the story he communicates by ringing a bell. But after being moved to a nursing home he communicates by spelling out messages with the assistance of a nurse who holds up a card with columns and rows of letters. This hack automates that task, trading the human assistant for a blink-based input system. [Bob Stone] calls the project BlinkTalk. The user wears a Neurosky Mindwave Mobile headset. This measures brainwaves using EEG. He connects the headset to an mBed microcontroller using a BlueSMiRF Bluetooth board. The microcontroller processes the EEG data to establish when the user blinks their eyes. The LCD screen first scrolls down each row of the displayed letters and numbers. When the appropriate row is highlighted a blink will start scrolling through the columns until a second blink selects the appropriate character. Once the message has been spelled out the “SAY!” menu item causes the Emic2 module to turn the text into speech. If you think you could build something like this to help the disabled, you should check out thecontrollerproject.com where builders are connected with people in need. [Dino] is about three-quarters of the way through his talking box project. 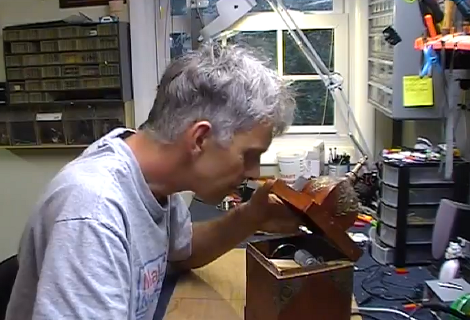 He’s completed one of the two boxes, and is showing off the technique he uses to marry motion with sound in order to mimic flapping lips with the box top. You may remember [Dino’s] first look at the EMIC2. It’s a single-board text to speech module which is what provides the voice for the box. But what fun is that without some animatronics to go along with it? So [Dino] started playing around with different concepts to move the box top along with the speech. This is easier said than done, but as you can see in the video after the break, he did pull it off rather well. He built a motor control circuit that takes the audio output of an LM386 amplifier chip and translates it into drive signals for the motor. The shaft is not directly connected to the lid of the box. Instead it has a curved wire which is limited by a piece of string so that it doesn’t spin too far. It lifts the lid which is hinged with a piece of cloth. 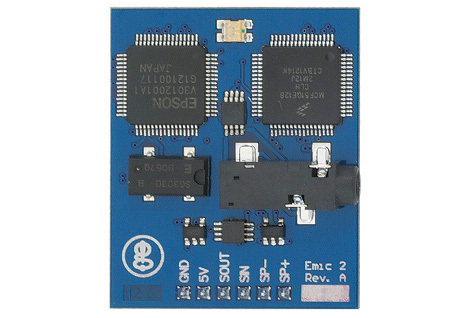 This is the EMIC2 text-to-speech module. You can see from the logo on the bottom left it’s the latest gadget coming out of [Joe Grand’s] Grand Idea Studios. [Dino] tipped us off about his first experience with a prototype of the board. He’s driving it with an Arduino and the video after the break shows that the sound rendering is high quality and the words are very easy to understand. One of the things that we think is interesting is that the serial communications used to drive the board are not uni-directional. In fact, there’s a serial terminal that provides documentation on how to use the chip. Obviously this is most suited to the Arduino, which always has a PC-side terminal window available to it. [Joe] himself shows some of the potential for the board. He gave new life to a broken toy by replacing its internals with a PIC-based circuit to drive the EMIC2. That video is also found after the break. He’s just using the demo clips, but from that you will get a good idea of the vocal modulations this device is capable of. The board rings up at $60 and is available from Parallax.